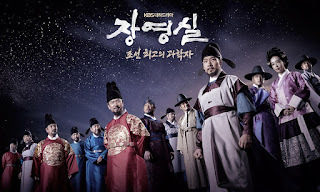 Cast: Song Il Gook, Kim Sang Kyung, Kim Young Chul, Park Sun Yeong and Kim Do Hyun. Born Eun Bok, Jang Yeong Sil (Song Il Gook) was the son of a noble man and a giseng. Living as a low-class servant, Yeong Sil meets his father Jang Sung Hwi (Kim Myung Soo) as a youngster. His father notices his intellect and brightness, and decides to introduce him to the world of astronomy. Unfortunately, due to the change to Joseon from Goryeo, the government (and king) is very strict about the newly made rules. Sung Hwi realizes that his son will never be able to utilize his potential in the world of class difference and decides to leave him for Yeong Sils own good. This leaves a heartbroken Yeong Sil, but doesn’t ruin his love for astronomy. While being hated, and envied by his former master Jang Hee Je (Lee Jee Hoon), Yeong Sil decides to work as a smith, only to be patronized by the magistrate. One of my favorite stories from the Joseon period; the story of the genius slave dreaming of the stars. It is also the story of King Se Jong, but in this case his rise to power and all involved was pushed a bit back. Though I was annoyed at the invented character, the princess (Se Jongs sister), I was able to watch all of it with a smile. The overall storyline was good, and quite close to the real story, of course there were a few dramatizations and a few things left out – but all in all close. Casting Song Il Gook as the lead was good, but I still can’t imagine Jang Yeong Sil looking like him… But then again, he kind of felt right. I watched the King Se Jong drama a few years back, and I was a bit nervous to see who they would cast as Se Jong since the cast was superb last time, and to my amazement both Se Jong and Tae Jong were the exactly same actor! I don’t know how they did it, but thank God, they did! Made me enjoy it more. So, to sum it up: a good story with a nice hint of historical correctness.